SAN FRANCISCO—September 19, 2017—Salesforce [NYSE: CRM], the global leader in CRM, today announced the next generation of Sales Cloud Einstein, bringing AI to every step of the sales cycle, from building pipeline and closing deals, to growing the business. With the new Einstein Forecasting, sales leaders gain visibility and intelligence to more accurately predict sales revenue at every stage in the sales cycle. 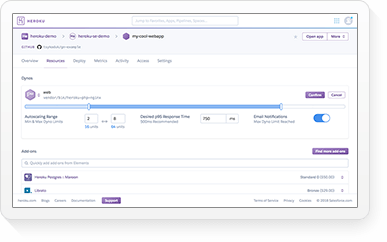 In addition, Einstein Opportunity Scoring automatically prioritizes high-value opportunities and Einstein Email Insights automatically identifies the most important emails, enabling sales reps to sell faster and smarter. From the head of sales to the CFO, Einstein Forecasting delivers a breakthrough innovation that drives business predictability. Sales leaders still rely upon incomplete spreadsheets and antiquated systems to forecast sales projections, resulting in inaccurate forecasts, underperformance and a disconnected business. In fact, less than half of deals close as forecasted, leading to missed quotas for sales teams and revenue shortfalls. 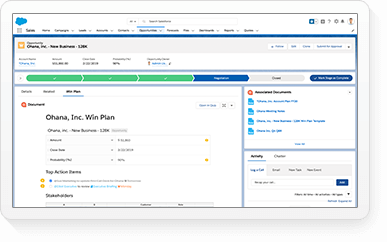 Einstein Forecasting is a fully automated, out-of-the-box solution that uses all of a company’s historical CRM data to take the guesswork out of forecasting. 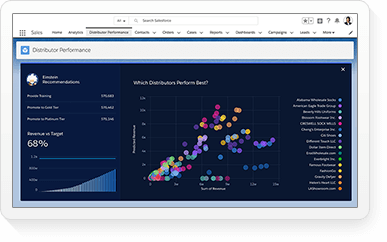 Combining the art of data mining and science of machine learning, Einstein Forecasting is able to analyze, process and understand key factors like seasonality and historical performance to make highly accurate, individualized sales forecasts. Additionally, Einstein Forecasting combines a unique mix of self-learning algorithms that learn individual and team forecasting behaviors, analyzes whether they are consistently optimistic, pessimistic or on target, and then synthesizes an unbiased analysis for the sales leader. Then, Einstein uses special logic to translate the data behind each forecast into human language so sales leaders know what to expect from the pipeline and why. With Einstein Forecasting, a regional manager for an insurance company, for example, can quickly view a dashboard to see if his team is on track to hit its sales numbers for the quarter or if any deals are in jeopardy. 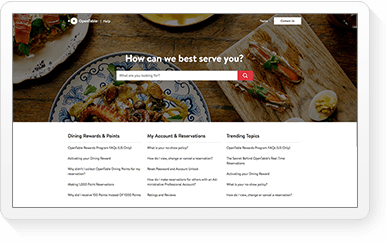 With foresight from Einstein Forecasting, the regional manager and other sales leaders can take action with their sales agents before it is too late to get the quarter back on track. 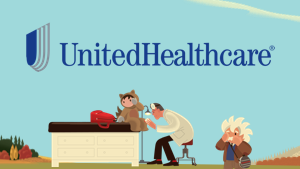 Additionally, if the CFO of the insurance company is looking to expand the business to a new region but unsure if the company can take on the development cost, she can quickly tap into Einstein Forecasting to predict whether the company will have enough funding that month or quarter to take on the new region. 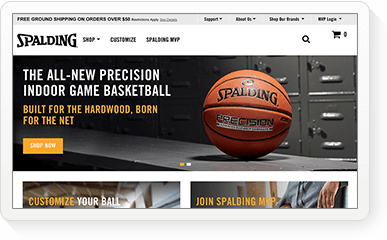 In addition, Salesforce also introduced Einstein Opportunity Scoring and Einstein Email Insights, ensuring sales reps stay focused on the most important deals. 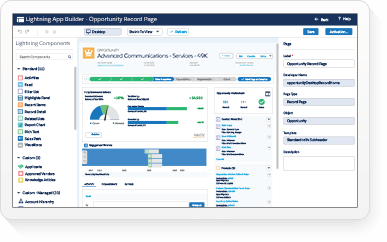 Einstein Opportunity Scoring—Identifies, surfaces and prioritizes the most valuable deals—those with the largest deal size, most executive engagement and more—directly within Sales Cloud. Additionally, Einstein continues to monitor deals in progress to identify any high-value deals that may be in jeopardy, keeping sales reps laser-focused on building pipeline and closing more deals. For example, with Einstein Opportunity Scoring a sales rep no longer has to spend countless hours sifting through opportunities. Instead, sales reps are able to focus on the deals most likely to close and add resources to deals that may be at risk. Einstein Email Insights—With Einstein Email Insights every sales rep is armed with their own personal email assistant. 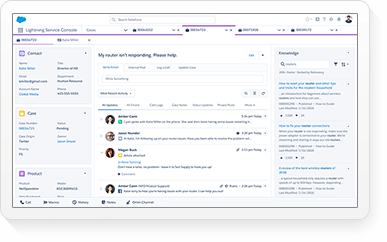 Powered by natural language processing (NLP), Einstein Email Insights identifies the most important emails and recommends the best action or response, enabling sales reps and leaders to prioritize their inbox and quickly address customer needs. Proactive action and response recommendations enable reps to keep deals moving, from scheduling a meeting to sending a quote. For example, if a sales rep is returning from a full day of customer meetings to an inbox full of emails, they no longer have to dig through their inbox to find the most important emails. 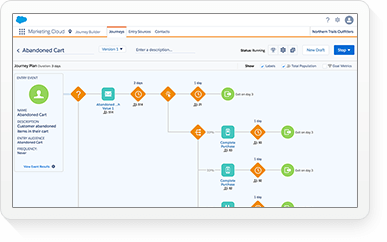 In September 2016, Salesforce introduced Einstein AI to bring the power of artificial intelligence to every business user. In the months since, the company has infused advanced AI capabilities across the Customer Success Platform to transform customer experiences across every touchpoint. Today, Einstein is delivering more than 475 million predictions daily, enabling trailblazers including U.S. Bank, Room&Board, FareCompare, Silverline and Black Diamond to be smarter, more productive and predictive about their businesses. 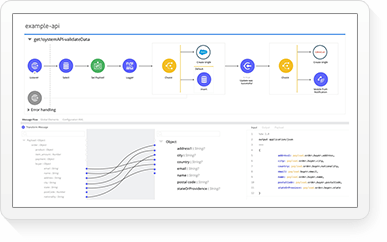 In addition, Einstein Platform Services empowers developers of any skill level to build AI-powered CRM apps using computer vision and natural language processing—with clicks, not code. Already there are more than seven thousand developers building Einstein-powered apps. As Salesforce Einstein’s pace of innovation continues, Salesforce Research is focused on pushing the state of the art in deep learning. Under the leadership of Chief Scientist Dr. Richard Socher, the group has published 10 academic papers in its first year, bringing cutting edge technology to Salesforce customers. For more highlights from Einstein’s first year, see here. To fuel the development of new AI solutions, Salesforce Ventures—Salesforce’s corporate investment group—today announced the new $50 million Salesforce AI Innovation Fund. Fast-growing AI start-ups Highspot, Squirro and TalkIQ are the first recipients of funding from the Salesforce AI Innovation Fund to accelerate their development of transformative AI solutions on Salesforce. Additionally, Salesforce Ventures has completed an investment in All Turtles, an AI startup studio that partners with founding teams and companies to build AI-centric products. Salesforce will partner with All Turtles to co-create cutting edge AI solutions built on the Salesforce platform. 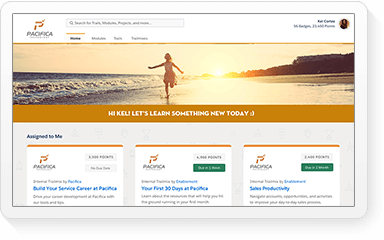 Sales Cloud, the world’s #1 intelligent sales platform, delivers an unparalleled user experience—enabling sales teams to sell faster, smarter and the way they want. No matter the industry, role or company size, Sales Cloud arms salespeople with the intelligence and insights they need to navigate and manage the entire sales process, from lead-to-cash. 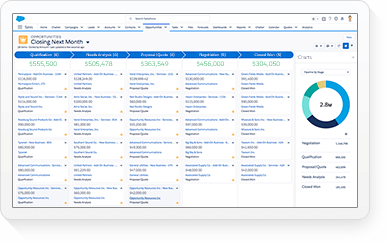 In the first half of 2017, Salesforce continued to extend the Sales Cloud platform with the introduction of Einstein High Velocity Sales Cloud, arming sales reps of all levels with the intelligence they need to achieve new levels of productivity; and Sales Cloud PRM, enabling channel partners to close deals faster than ever. Companies that have deployed Sales Cloud have seen an average 35 percent increase in sales productivity, a 30 percent increase in lead conversions and an overall 25 percent increase in revenue. Einstein Forecasting, Einstein Opportunity Scoring and Einstein Email Insights are currently in pilot and expected to be generally available in the first half of 2018. Pricing will be announced at the time of general availability.